(CNN) -- Provisional Honduran President Roberto Micheletti told reporters Wednesday that he would be willing to step down as long as ousted President Jose Manuel Zelaya ceases his claims to the presidency. Deposed Honduran President Jose Manuel Zelaya says he must be returned to power. The provisional president said that if it became "extremely necessary" for him to step down in order to maintain peace in the country, he would, as long as Zelaya was not restored to power, Micheletti's son, Aldo Micheletti, confirmed to CNN en Español. Meanwhile, Zelaya said his followers plan to take action inside the country this weekend, ratcheting up pressure on the provisional government that has ruled for more than two weeks. Speaking on his arrival in Guatemala on Tuesday for talks with President Alvaro Colom, Zelaya vowed to return to his home country. He did not say when. "This weekend we are planning many internal activities in the country," he said. "We are not going to rest, and the public is not going to rest, because the right against oppression is a right that people have." Asked in an interview by CNN affiliate Noti7 TV if he supported insurrection, Zelaya skirted answering directly. "In this case, the public has a right to defend itself," he said. Zelaya also said that in a country where eight of every 10 Hondurans live in poverty, public discontent was common. "That leads to a general insurrection," he said, later repeating, "That leads to a permanent insurrection by the people against the government." 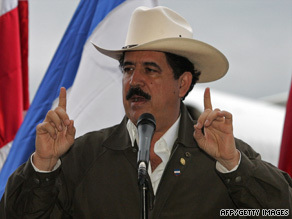 The Honduran army removed Zelaya from power on June 28, putting him on a plane to Costa Rica. Congressional leader Micheletti was sworn in as provisional president that afternoon. The overthrow has drawn international condemnation, with the United Nations, the Organization of American States and the European Union demanding that Zelaya be restored. The OAS suspended Honduras on July 4 and many countries have withdrawn their ambassadors. Micheletti has argued that Zelaya's removal was a legal constitutional transfer of power. Micheletti and Zelaya accepted an offer from Costa Rican President Oscar Arias to mediate talks. Both men met individually with Arias last week, but they did not meet face-to-face. Earlier this week, Zelaya issued an ultimatum: If the ongoing negotiations do not restore him to power, he will consider the talks failed and resort to other means. He did not elaborate. The statement puts pressure on the next round of mediation between the two sides, expected to take place Saturday in Costa Rica. Zelaya, a leftist who took office in 2006 after a narrow victory, had been at odds with Honduran lawmakers, the country's supreme court and the military over a referendum he had planned to hold last month. Congress had forbidden it and the supreme court ruled it illegal. The military declined to participate in its usual role of safeguarding the vote, saying it could not take part in an illegal act. Zelaya vowed to hold the ballot anyway, but he was toppled before the voting started. He sought the referendum to see if voters wanted a measure on November's ballot to establish a constitutional assembly to study whether a president could run for re-election. Under the current charter, a president can serve only one four-year term. Venezuelan President Hugo Chavez, a Zelaya ally, won a similar referendum this year and many Hondurans thought Zelaya was trying to find a way to seek re-election in November -- an assertion he has denied. His term ends in January. After 18 years of nearly uninterrupted military rule, Honduras returned to civilian control in 1981. Since then, the military had not seemed interested in holding power.